President Benigno "Noynoy" Aquino III, at a dinner in Malacanang Palace in celebration of the Liberal Party's 65th Anniversary acknowledged the support of the Friedrich Naumann Foundation for Liberty (FNF) Philippine Office in promoting liberalism and advancing reforms in the country. President Aquino also appreciated the work done by the Council of Asian Liberals and Democrats (CALD) in bringing Asian Liberals together. Prior to the dinner at the Palace, a program in Club Filipino was held to announce the results of the LP elections for National Officers. Former Senator MAR Roxas was given a fresh mandate to lead the LP. It was also in this event where President Aquino proudly expressed his association with LP. "To those who haven't realised it, I am a Liberal and proud of it," he announced, which generated an ovational applause. 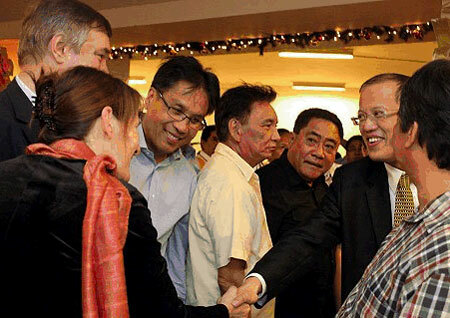 Liberal Party President MAR Roxas introduces FNF Philippines Country Director Jules Maaten and wife to President Aquino during the LP Christmas Party in Dec 2010.